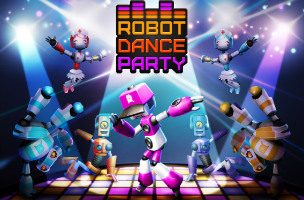 DeNA has released Robot Dance Party on iOS and Android devices, introducing players to a new rhythm game experience that follows robots who want to let out some steam on the dance floor. Players can create their own robots and take them into dance battles, tapping, sliding or tapping and holding on the screen as prompts appear throughout each song. During each song, players must watch for different kinds of prompts. For instance, light blue prompts are single-tap instances, while purple prompts require users to tap and hold on the screen until a timer runs down (represented by a purple shaded area moving around the prompt). Green sliding prompts ask users to tap and slide their finger along with a circle as it moves across the screen, yellow prompts ask players to flick their finger in the marked direction, and so on. The more accurately players tap on these prompts in time with the music, the more points they’ll earn. That is, if players are just off the mark, they might receive a good rating and a small amount of points, but hitting it exactly offers a perfect rating and a score boost. Two final elements are for the robot’s signature move and freestyle instances. The signature move is triggered by tracing a line on a circuit board within the robot, and results in a high score boost, while the freestyle instances allow players to create their own dance moves by tapping on different areas of the screen in time with the music. Each song is available in three difficulty levels, with higher difficulties increasing the number of symbols that appear, or their speed. Some songs may offer multi-touch prompts, for instance, which require users to tap or tap and hold with two fingers at the same time. Players spend energy to access songs, with energy recharging automatically over time, or being available to purchase with real money. Players must earn a minimum number of points to pass each section of a song. At the end of each complete song, users receive experience points for each individual part of their robot, from head and torso to arms and legs, as well as experience points for their overall player (this is used to unlock new songs at the menu). Some parts are better suited to particular types of songs, and players can swap out their current robot parts with new and additional parts between songs. Players can purchase new parts with nuts and bolts, the game’s free currency, or with gears, a premium currency. Finally, players can sell their excess parts for nuts and bolts, if they no longer wish to use those parts on their robot. For social play, gamers can challenge their friends or random players to dance offs. These break each song down into sections with one section completed per user on each turn. These events score users based on the accuracy of their timing, rather than on earning large numbers of points. Finally, the game allows users to share replays of their dances with others through email, or on Facebook, Twitter or YouTube. Robot Dance Party is available to download for free on iTunes and Google Play.